Original Creditor - The original creditor name is the name of the company or agent who originally opened the account for the consumer. This free-form description of the original creditor name is used by collection agencies, debt collectors, factoring companies, check guarantee companies, student loan guaranty agencies, and the U.S. Department of Education. For companies who report returned checks, such as collection agencies, report the name of the payee. To assist with compliance of the Fair Credit Reporting Act, companies who report medical debts or returned checks for medical purposes must report Creditor Classification ‘02’ (Field 3) to indicate ‘Medical/Health Care’. 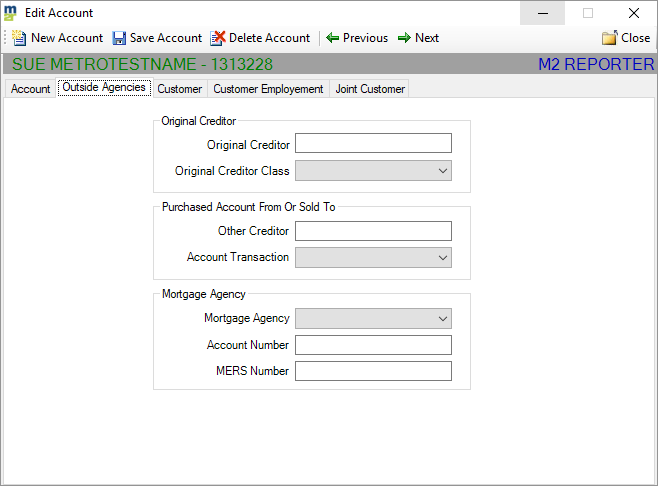 The actual name of the original creditor should continue to be reported in Field 2. One of the following three options should be used when reporting a creditor’s name that would reveal sensitive information about the consumer. 1. Report the name of the institution, but do not include reference to the type of service. For example, use the hospital name without identifying that it was the psychiatric unit that provided care. If a hospital’s name reveals sensitive information, abbreviate the name. 2. Use the corporate name if it is different from the commercial name of a mental institution or drug rehabilitation center. Note: Do not report the account if either of the above two options would not sufficiently protect the consumer’s privacy. Encoded information is not acceptable in this field. Other Creditor - This option may be used to report the name of the company from which the portfolio or partial portfolio was purchased or the name of the company to which the portfolio or partial portfolio was sold. Note: Account Purchased information should not be reported by collection agencies, debt purchasers, factoring companies, check guarantee companies, student loan guaranty agencies and the U.S. Department of Education. Account Number - Contains the account number as assigned by the secondary marketing agency. Do not include embedded blanks or special characters. Note: If the Mortgage Agency is 00, Agency Identifier not applicable, this field should be blank .